SSD Coriander will begin her advanced training at the SSD kennel on July 6. She's a real sweetheart and we're very excited for her to start her training. She will leave her puppy raiser family, where she has spent most of her life, and start learning the advanced skills she'll need to one day assist her partner. Coriander's success in advanced training is greatly increased because of the solid foundation of behaviors and skills she gained from her time with her puppy raiser family. Although a dog's success in advanced training and as a service dog does not necessarily depend on their puppy raiser's ability to train them, the puppy raisers do give the dog a foundation of skills and behaviors that are essential to their success in advanced training. In fact, dogs that receive this foundation tend to complete their advanced training more quickly. SSD has been blessed with a wonderful group of puppy raisers. Our puppy raisers are volunteers who donate their time and love to a puppy that will live with them for 15 to 18 months. We depend on these volunteers because, as the name "puppy raiser" suggests, they raise the puppies during the time when they are young and learn new behaviors easily. If you have a dog of your own, you probably know that it's easier to teach young puppies than it is to train older dogs, though it's certainly not impossible to teach an older dog new tricks! But even more than that, the job of the puppy raisers is to give the puppies lots of love. It's possible for anyone to become a puppy raiser for SSD. You do not need to have previous experience training dogs. You just need to love animals, have an open mind, be willing to learn, and be positive, patient, inquisitive and generous. We can train you to train an SSD puppy. However, we do have certain criteria that we look for in our puppy raisers. In our next post, we'll share some of the things we look for in our puppy raisers and how you can apply to become one. 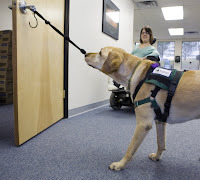 At the Dauphin County Conservation District, eight service dog teams move around the room. You can hear commands and clicks as partners and dogs practice skills together. One partner tells his service dog to "Leave It" when the dog starts to investigate an object on the floor. The dog obeys, receiving a click and a treat. In a separate room, a hearing dog practices with her partner. A timer is set to go off at varying intervals and the hearing dog must alert her partner every time it beeps. She successfully alerts every time. This is just a very brief snapshot of the Team Training we held from June 8 through June 19. Team Training prepares partners and service dogs to begin their lives together. Throughout the past two weeks, teams listened to presentations about training and working with service dogs and had plenty of time to ask questions and practice with their service dogs. They also did home visits. Team Training gives partners and their service dogs a chance to bond and start to learn each others' habits. This year, we had a large class - eight partners and dogs, including two hearing dogs, one balance dog and five service dogs. Five partners were receiving successor dogs. These five individuals had previously had a service dog through SSD, but their dog may have passed away or is ready to retire. All eight teams have successfully completed Team Training and took their practice access and skill tests yesterday. Today they're visiting the Whitaker Center to practice working as a team in a fun, public place with lots of distractions for both dogs and partners. On Wednesday, teams will take their final access and skill tests and then sign the papers that will make them official SSD teams! Each partner has worked so hard and risen to every challenge, and we have confidence that they will all be successful in their lives as service dog teams. We wish SSD Roanoke, BeBe, Larch, Sadie, Bryce, Sedona, Jonagold, York and their partners good luck! We mentioned in Part 4: Canine Manners Around Food that crates are a source of comfort and relaxation for our service dogs. Crates are not a form of punishment. In fact, because crates become a happy, stress-free place for our dogs, the dogs sometime choose to go in them just to hang out and relax. One SSD puppy once fell asleep in his crate - he was flopped on his side, perfectly relaxed, with his head lolling out of the crate door! Since we use crates in training and they become an important part of a service dog's life, we have certain expectations for behavior when dogs go in their crates. When they're in their crate, service dogs should be able to chill out and relax - no whining or barking - and they wait patiently for a verbal cue to leave the crate. To get puppies used to their crate, we feed them at least one meal inside it. Receiving a meal in the crate helps the puppy associate the crate with good things, so it becomes a happy place. When we're teaching puppies to wait quietly and patiently until they're released from the crate, we use a method similar to our method of teaching dogs not to bolt through other doors. (Read Part 5: Dogs and Doors - Patience Is a Virtue for our post about bolting through doors.) If the puppy starts to move when we open the crate door, we close the door and don't let the puppy out. When the puppy is once again waiting quietly, we try opening the door again. If he tries to barge through again, the door closes. The door only opens completely when the puppy stays patiently. Similarly, if the puppy starts barking or whining when we start opening the door, the door closes until the puppy quiets down. Sometimes this takes patience on our part, but it's important to outlast any vocalizing. When the puppy is both quiet and staying patiently, we then open the door and signal the puppy to exit the crate by saying "okay." Throughout the process of opening the crate door and releasing the dog with an "okay," we don't use the "stay" command. We want our dogs to learn that when they're in a certain environment, in this case the crate, they must always "stay," even if there is no specific command. Service dogs often need to be as unobtrusive as possible, automatically giving behaviors depending on the environment and other cues. How many doors do you go through in a day? Probably more than you realize. We started counting how many times we went through doors but lost track somewhere around 40. One way a service dogs helps his partner is by opening all those doors. However, even more important than the skill of opening doors is the patience to wait calmly while a door is opened. You've probably noticed how excited your dog gets when you open the door to go outside. He probably prances in place and bolts through the door as soon as you get it cracked open. Our service dogs are no different before they complete their training. Just like any dog, they sometimes get so excited to go outside that they try to dash out the door before we barely get it open. They may try to bolt, but we don't let them. We train our service dogs to wait patiently - either sitting or standing - until we give them the "okay" to go through the door. Especially when we're opening the door to the outside, we want to make sure it's safe for the dog to go through. And once the dog is placed with his partner, the dog may need to wait patiently by the door for the safety of his partner, as well. We use a fairly simple method to teach our dogs to wait calmly when we're opening the door to the outdoors. We start to open the door, and if the dog moves toward the door, we close it. (Being careful not to close the door on the dog, of course!) We repeat this process until the dog waits patiently when the door is opened and only goes through when he's released. During this process, we usually keep the dog on a leash. That way, if he manages to get through the door before we can close it, we can easily bring him back inside to start over. Once the door is open, we give the cue for the dog to go through ("okay," "go on through," "let's go"). There is no need to give the dog a treat for waiting calmly. Getting to go outside is enough of a reinforcement or reward. The dogs soon learn that patience is a virtue when it comes to doors. Next post: crates and time for chilling out. While meals are being prepared, regardless of whether it's a four-course dinner or a quick midnight snack, our service dogs must stay away from the food. Dogs can either remain in a down-stay or just remain out of the area. We do not want our service dogs sniffing or counter-surfing (running their nose along the counters in hopes of swiping tasty people food). We actually do not even want service dogs to be underfoot when food is being prepared. The dogs could become a danger to both themselves and their partners if they're wandering through the kitchen while their partner is making a meal. Service dogs must also ignore any food left on counters, the stove, tabletops, etc. when their partner leaves the room. We start teaching dogs to leave people food alone when they're still puppies. We start by crating them during food prep. Now, many people associate crates with punishment, but that isn't true for our service dogs. Crate actually become sources of comfort for the dogs, especially because service dogs are working dogs. When our dogs go in their crate, they know that work time is over and they can just relax and hang out. If we don't crate puppies during food prep, we keep one eye on the puppy so we can proactively discourage any attempts to check out the people food. For example, we might use a gentle "eh-eh" sound or push them off the counter. When the puppy stays away from the counter on his own, we reinforce his behavior with good things, such as attention or treats. To help teach puppies to ignore people food, some of our puppy raisers begin by eating a snack at a coffee table. They may use clicker training to reinforce the puppy's behavior when the puppy ignores the food. Using this method, one puppy raiser can now eat on the couch with her service-dog-in-training at her feet, and the dog shows no interest in the food! When we find our older dogs (4-6 months or older) sniffing around the counters or with their paws actually up on the counter, we use stronger verbal correction and push the dog off the counter. For older dogs, a dog bed can serve as a good place to "anchor" the dog during food prep. The dog learns to stay on his bed while his partner is preparing food, unless instructed otherwise. When teaching dogs not to counter-surf, it's important to remove any items from the counter that might tempt the dog, especially if you need to leave the room. At meal time, our service dogs must lie quietly or just "hang out," meaning the dog stays away from the table and shows no interest in the food. This will take lots of practice. If dogs sniff at food, we use a verbal "eh-eh" sound. Some of our puppy raisers keep a cup of kibble on the table to reinforce their dog for good behavior. Ultimately, our service dogs need to perform good manners around food regardless of where they go. This means that in restaurants, they must lie quietly under the table without sniffing, whining or barking. It's easiest to teach good behaviors at home and gradually introduce the dog to other environments to generalize behaviors. Check out the photo on SSD Hawk's blog to see an example of a service-dog-in-training's self control around food. Even though some of the goodies are dog treats, it demonstrates the skills around food that we're looking for in our service dogs. Look for our next post about dogs and bolting through doors. It has been a busy few weeks for SSD! We recently held our 16th Annual Celebration and Graduation for our service dog teams. Twelve dogs graduated! Seven of those dogs are now paired with their partners, working as service dogs. One dog became a facility dog with the Hill Top Academy, one is an in-home service dog, another is a companion dog, and two are demo, therapy and interview dogs! Graduation highlights exactly why we exist. As we officially paired service dogs with their partners, we could see how these dogs changed lives. Our work and the work of other service dogs organizations is so important because it allows people to live full, rich and independent lives. We had promised to post some of our guidelines for the good manners we expect from our service dogs, so here are just a few of them. Over the next few weeks, we'll post more of them. All of our SSD puppies are trained to stay off the furniture unless they are invited up. Whether a service dog is allowed on the furniture is ultimately the decision of the service dog's partner, but until dogs are placed, we train them to stay off furniture. We begin teaching puppies to stay off furniture as soon as they're tall enough to jump up. With their natural curiosity, most puppies will try to jump up, and we stay vigilant and simply remove them from the furniture. We use the same procedure with older dogs, though we must watch them more closely since jumping on furniture may already be a learned behavior. We then use clicker training to teach our dogs when it is okay to jump up on the furniture, adding an "okay" or "all the way up" cue and patting the furniture. We also use clicker training to teach "off." When teaching "off," dogs must get off the furniture and stay off. Because teaching dogs to stay off furniture requires you to watch the dogs closely, you may have to crate your dog when you're not home. If you're leaving your dog uncrated, make sure you block access to furniture so your dog doesn't jump up when you're not there. If you make it impossible or at least very difficult for dogs to jump on furniture when you aren't home, they'll learn that they shouldn't jump on the furniture at any time. Otherwise, they may learn that it's okay to jump on the furniture when you're not around, even through they may stay off it when you're home. We want our service dogs to have wonderful manners when greeting people, and that means no jumping on people. Service dogs must keep all four paws on the floor when greeting people, regardless of the environment. Furthermore they should do this without any special cues, restraints or treats from their partner. To teach dogs to keep all four feet on the floor, we never reinforce jumping, even with puppies. It may be cute when a little puppy greets you by putting his front feet on your legs, but if you reinforce this action as a puppy, you'll soon have a full grown dog jumping up and putting his feet on your shoulders. This means that when your puppy jumps on you, you should not lean down to pet him, talk to him, or reinforce the action in any other way. Neither of these options harms the dog and they soon learn to keep all four feet on the floor. Our next post will share our guidelines for service dogs and food.